We just launched a new project - They Draw and Travel. Here is a batch of 6 maps of some of our favorite places. Visit www.theydrawandtravel.com to see dozens of maps from exciting places like Glascow, Malta, Prague, Brooklyn, Brussels, Tel-Aviv, Venice Beach and many more! To kick off this new project we're hosting a big fun contest. Visit the website for details and tell your friends! 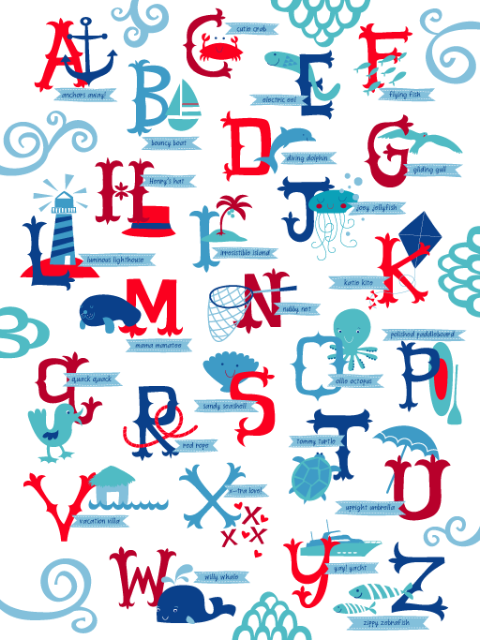 And, last but not least, Salli made this wonderful nautical alphabet for our niece Julie's baby shower. It's available for commercial use too! **Be sure to check out the They Draw and Cook too- it's a great source for discovering new freelance talent! i love the nautical alphabet! is it available to purchase? if so, where?! thanks for admiring my nautical alphabet! it was purchased by a company for wall decals awhile ago...maybe you can find it in Target? Although I believe it was a different color way. I no longer have the rights to sell prints of this image ... sorry!